Hey! Are you passionate about fashion? Wish that one day you can have your own showcase. To be known Well this is not a dream, buckle up and don’t miss this opportunity because AirAsia, the world’s best low cost airline just launched the AirAsia Runway Ready Designer Search 2015 (AARRDS 2015) to develop the talent of tomorrow and enabled young talents to realize their dreams. From left: Jovian Mandagie, Malaysia’s renowned fashion designer; Aireen Omar, CEO of AirAsia Berhad; Andrew Tan, Founder of Kuala Lumpur Fashion Week Ready To Wear (KLFW RTW); Khairul Abidin Ishak, Editor of EH! This initiative aims to help create a platform for young aspiring talents in the fashion industry to kick start their journey and realize their dreams to be a part of the local and international fashion scene. AirAsia collaborate with the renowned KL Fashion Week team for the AARRDS 2015; so there will be 10 shortlisted young designers to showcase their designs at the upcoming Kuala Lumpur Fashion Week Ready To Wear 2015 (KLFW RTW 2015). 10 young designers will be able to showcase their creations on the prestigious runway stage of KL Fashion Week RTW 2015 and three best designers will be revealed at the end of the search and claim the title of ‘AirAsia Most Promising Designer 2015’, along with other prizes which include AirAsia Runway Ready Designer Search trophy, return flights to Tokyo, Sydney and Hong Kong,up to 60,000 AirAsia BIG Points each, a chance to be part of other Fashion Weeks in the region and more. Fashion designers from around the region will also be flown in by AirAsia to be part of KLFW RTW2015, and this will also provide the 10 young designers with an opportunity to meet and learn from them. Fashion industry heavyweights Khoon Hooi and Jovian Mandagie, Malaysia’s renowned fashion designer; and Khairul Abidin Ishak, Editor of EH! 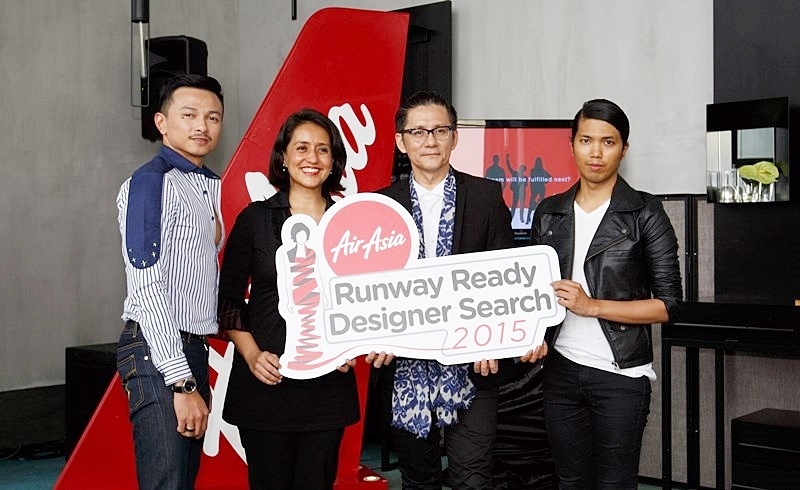 Magazine was announced as the judging panel for the very first AirAsia Runway Ready Designer Search 2015. This designer search is open to any young aspiring fashion designers with or without formal fashion training, and no older than 28 years old in 2015. Interested designers can enter by completing the registration form which can be downloaded at www.klfashionweek.com/airasiarunwayready and submit your sketches. Submission deadline will be before 5.00PM (GMT +8) on 12th June 2015. The Top 25 shortlisted applicants will be notified to present their design collection aptly themed ‘Asean’ to the panel of judges. The Top 10 which will be featured at the KLFW RTW 2015 runway will then be selected through this session.